Turkey is not only fascinating because of its richness and modernity, but also this country offers you interesting things such as natural landscapes or The crossroads of East-West civilization. Come to Turkey, you will have the opportunity to discover architectural masterpieces and picturesque poetic villages. Now, let's take a look at the most attractive destinations in this charming country! 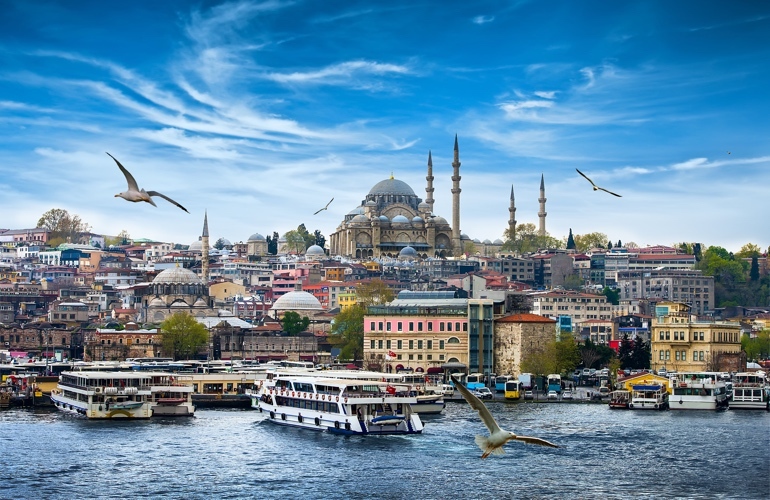 One of the most special things of Istanbul is that it connects Europe and Asia. This is actually the largest city and the cultural, economic and political center of Turkey. Famous for its many unique architectural styles and ancient beauties, Istanbul is a destination not to be missed to find out. In fact, you can visit The Blue Mosque, Hagia Sophia, Yerebatan Sarayi underwater palace, Topkapi palace … discover the vibrant culture of various ethnic groups and religions, also taste local gastronomy here! The Bosphorus strait is considered as the soul of Istanbul. 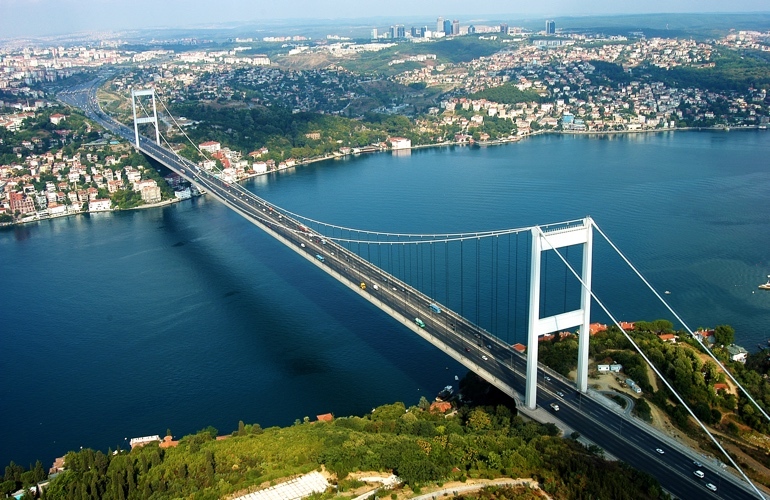 With a length of 33 km, Bosphorus connects two seas (Black sea and Marmara) and also two continents (Europe and Asia). It would be an unforgettable memory if you experience a cruise on the lovely Bosphorus river and enjoy the sunset of two continents. Furthermore, it will be an excellent opportunity for you to learn about the culture of the Byzantine and Ottoman Empire that date back from the 12th, 13th centuries. You will see the peaceful villages, the palaces of the Ottoman nobles, the lush green parks, the fortified fortresses, the bustling and classic bazaars ... all create unique paintings that you can only admire at the Bosphorus! Cappadocia is located in central Turkey's Nevsehir province, 290 km from Ankara. It is one of the most famous wonders in Turkey, recognized by UNESCO as a World Natural Heritage since 1985. 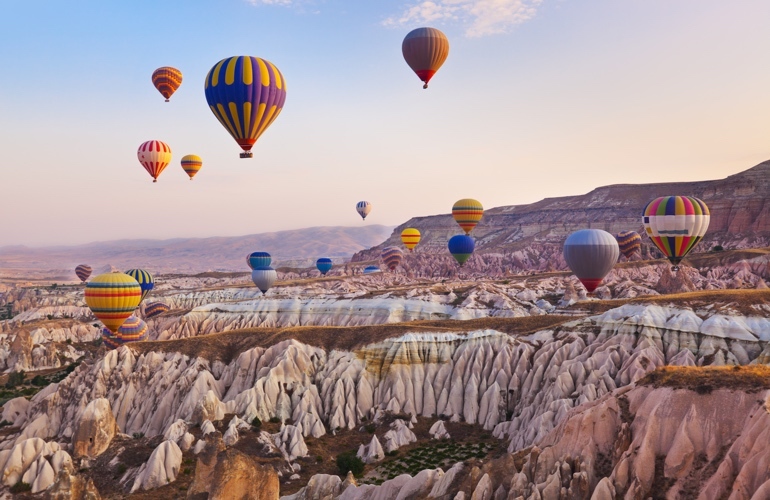 When traveling to Cappadocia, you can not only admire the majestic scenery with colorful balloons but also you can find out the monuments which are over 10 centuries old, including The Museum Goreme. Moreover, there is another unique place to visit - the underground city of Derinkuyu, located about 60 meters underground, that has enough room for up to 20,000 people. The oldest rooms were built in the 8th century B.C., and are still well preserved up to present. Cappadocia promises to bring you the marvelous beauty of the land and sky. 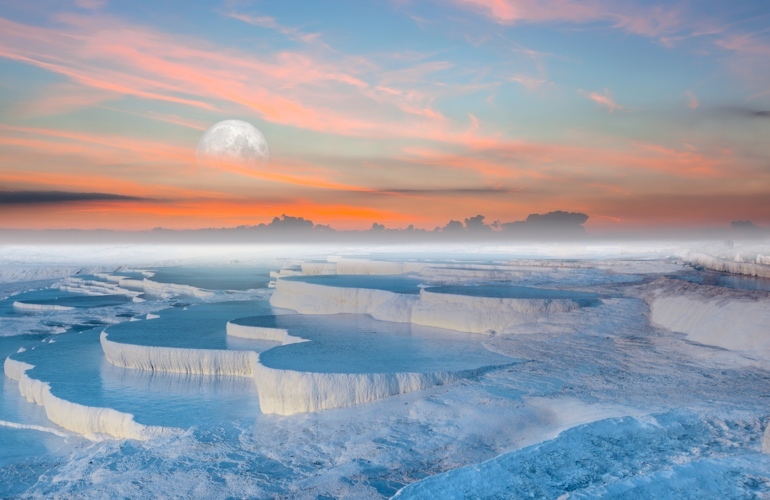 Known as a "jewel of Turkey", Pamukkale is one of the most spectacular natural wonders in the world. This is a natural site in the Menderes River valley of Denizli province. This gigantic architecture is 2,700 meters long, 160 meters high and 600 meters wide, that is why it can be seen from 20 kilometers away. One thing to note when you come here is the need to pay attention to protect and respect the environment, especially not to wear pointed shoes as they can ruin the layers of limestone there. 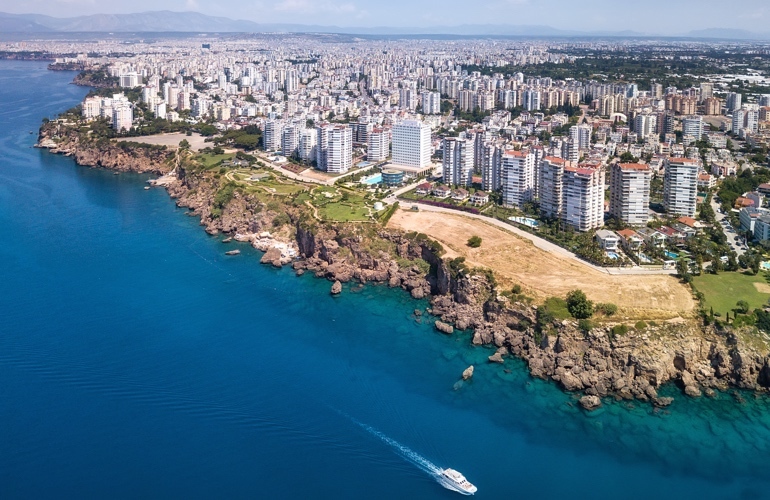 Antalya is located on the Mediterranean coast, south of Turkey. This city is surrounded by majestic mountains and 657 km of coastline with beaches, harbors and old towns. With 300 days of sunshine and fresh weather all around the year, it will be an ideal destination to enjoy tourism activities and observe wonderful landscapes especially the Manavgat waterfall which is 40m wide and less than 5m high down from the mountain Taurus. Although it is not a high waterfall, the flow is very strong and it is considered one of the symbols of Turkey. 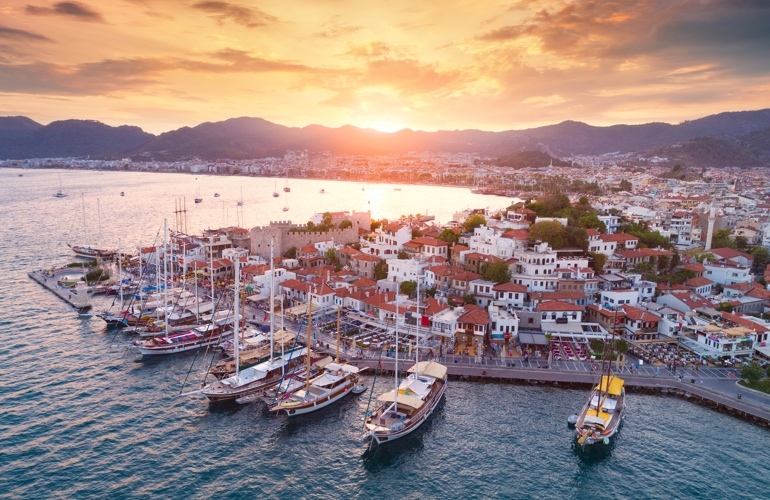 Famous as the sailing city and an exciting resort paradise, Bodrum will attract you by the luxury of the hotels, resorts, bars, and recreation centers. Indeed, you can easily see windy white sails along its beautiful beaches. Besides the luxury and modern beauty, you can also discover fishing villages, tombs, palaces, and theaters from ancient times. Marmaris is a town located along the Aegean coast, in the province of Mugla. It is famous for its beautiful beaches, smooth white sand, long stretches of green sea and unique tourist services. Marmaris is a resting place for long journeys, dynamic and calm at the same time. Here you can go to restaurants from luxury to popular ones to taste the delicious food or have fun in the bars, vibrant discotheques, shop in the city's malls. In particular, you can enjoy dances with hundreds of participants or music parties on the streets of Marmaris at night. 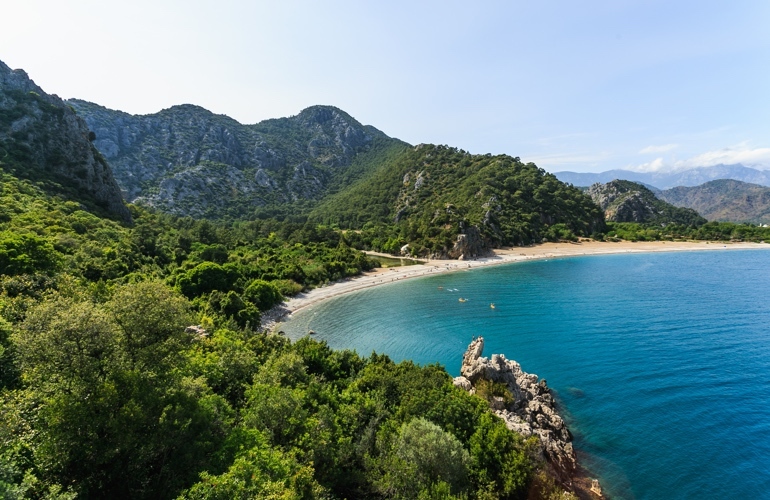 Olympus is a town located in Antalya Province bordering the Mediterranean Sea. There are many ancient architectural works, bringing in the outstanding historical and cultural values. The most prominent feature of Olympus are the ruins of Lycian, which attract many researchers to explore. In addition to that, you will also delight in the Mediterranean-style beaches or experience its unique tree houses.